Bret Stephens took no comfort in these caveats. 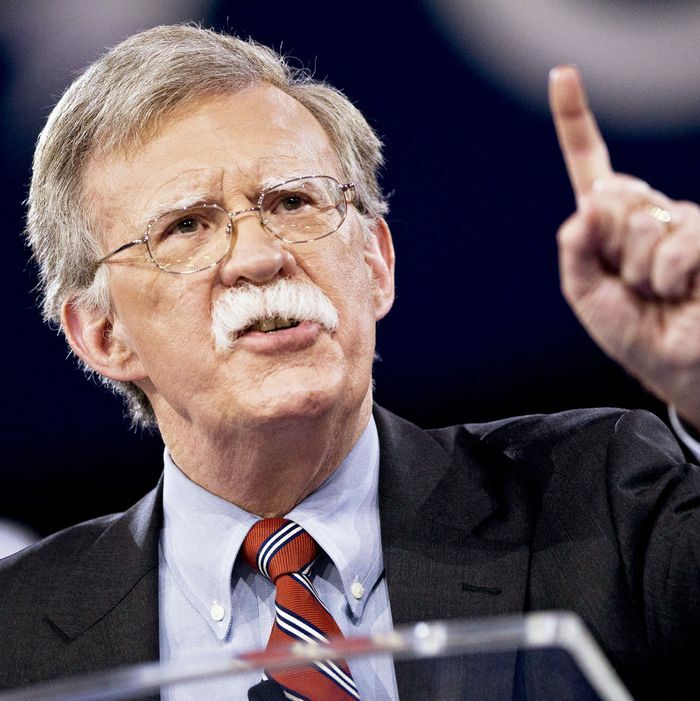 John Bolton spoke at Geller’s rallies against the “Ground Zero Mosque,” made numerous appearances on her video blog, and wrote the foreword to a book she co-authored in 2010 entitled The Post-American Presidency: The Obama Administration’s War on America. In that exposé, Geller claimed that Europe’s acceptance of Muslim immigrants constituted “slow cultural and demographic suicide” — and that “Barack Hussein Obama” was leading the United States toward “a soft sharia: the quiet and piecemeal implementation of Islamic laws that subjugate non-Muslims.” Not only has Bolton never disavowed his ties to Geller, he lent a laudatory blurb to a book she published in November of last year (Fatwa: Hunted in America). Bolton’s coziness with Geller is no aberration. He enjoys a similarly warm relationship with Frank Gaffney, founder of the Center for Security Studies and a world-class Islamophobe in the purest sense of that term: Gaffney claims that the Muslim Brotherhood has infiltrated the highest levels of the American government; that Clinton aide Huma Abedin and anti-tax crusader Grover Norquist are among this secret cabal of “stealth jihadists”; that Saddam Hussein was behind the Oklahoma City bombing; that Obama incorporated the Islamic crescent into the logo of a new missile-defense group; and Chris Christie’s decision to appoint a Muslim-American to New Jersey’s state judiciary might well qualify as an act of treason. Even the conservative movement couldn’t stomach bigotry this lurid and hallucinatory (or at least, not when it was directed against some of their own). In 2011, the American Conservative Union informally banned Gaffney from speaking at the Conservative Political Action Conference; but they welcomed Gaffney back into the fold last year — after Bolton personally intervened on his friend’s behalf. Bolton has, on occasion, disavowed anti-Muslim prejudice. When Donald Trump first unveiled his “Muslim ban” in late 2015, Bolton derided it as antithetical to American values. But in other moments, the soon-to-be national security adviser has echoed the hateful sentiments of his fringe associates. At one of Geller’s protests of the “Ground Zero Mosque,” Bolton argued that those who insisted Muslims had a right to open a place of worship in lower Manhattan were the real intolerant bigots, since they were effectively saying, “We want to increase religious tolerance and understanding, and if you don’t agree with that, we’re going to increase religious tolerance and understanding whether you like it or not.” And in a 2009 interview with Geller, Bolton reasoned, “As the saying goes from the Franklin Roosevelt era … ‘Not all Democrats are horse thieves, but all horse thieves are Democrats.’ Taking that forward, the terrorists today are Islamic fundamentalists.” When Bolton made this claim, the vast majority of terrorist attacks on U.S. soil over the preceding eight years had been perpetrated by white, far-right extremists. So, when Bret Stephens learned of Bolton’s appointment to a high-ranking White House position last week, he must have been apoplectic. After all, this standard-bearer of principled conservatism is so repelled by prejudice, he could not countenance the thought of the Democratic Party giving a leadership position to a man who had been affiliated with a bigoted organization decades ago. And unlike Ellison, Bolton had never broken off his ties with his hateful allies, or renounced their bigotry, much less campaigned for a presidential candidate who belonged to the religious community that his erstwhile friends had vilified. Ellison defended Farrakhan against charges of anti-Semitism in 1995; Bolton wrote the foreword to a book detailing Obama’s “soft sharia” agenda in 2010. John Bolton is a promoter of anti-Muslim bigotry and squarely within the mainstream of conservative foreign-policy thought. Alas, there is apparently some other, mysterious distinction between Bolton and Ellison that makes Stephens far more alarmed by the idea of the latter leading the DNC, than by that of the former commanding the National Security Council. He’s a former U.S. ambassador to the United Nations. He’s on the board of trustees of the National Review Institute. He’s a senior fellow at the American Enterprise Institute. He’s a conservative hawk, yes, but he’s squarely in the mainstream of conservative foreign-policy thought. This is absolutely right. John Bolton is a promoter of anti-Muslim bigotry and squarely within the mainstream of conservative foreign-policy thought. There is no tension between these two facts; because the leading lights of American conservatism — from Donald Trump to Bret Stephens — all accept that Muslims have earned some degree of collective stigmatization. They may disagree about how much; and some may only endorse this premise on an unconscious level. But in their words and deeds, conservative intellectuals make it unmistakably clear that they believe anti-Muslim bigotry is excusable in a manner that anti-Semitism is not. In the summer of 2014, two Israeli settlers kidnapped a 16-year-old Palestinian boy, beat him, and burned him alive, because they suspected that someone of the boy’s ethnicity had recently murdered three Jewish teenagers. The act was roundly condemned by the leadership of the American Jewish community. Would a Republican president have subsequently nominated him to run the Central Intelligence Agency? Would all but one member of the GOP’s Senate majority have voted to confirm him to that position? And would all of this have happened with little to no complaint from the conservative intelligentsia? Of course not; explicit Jew hatred has no place in the conservative mainstream. But John Bolton and Mike Pompeo — and anti-Muslim bigots of all colors and creeds — absolutely do.